We ordered the 8 oz filet, but a 12 oz option is available. All steaks come with sautéed spinach, julienned carrots and a choice of baked potato, mashed potatoes, garlic mashed potatoes, steak fries or Texmati rice. We asked for the filet to be cooked medium, and chose the garlic mashed potatoes. The filet was lacking in flavor, and the outer texture was too chewy at times. The middle was more tender, and we could tell it was a good cut of meat. Both the spinach and the carrots were delicious. The garlic mashed potatoes were tasty and there was plenty of it. For a good filet mignon or beef tenderloin in a similar price range, try the Filet Elizabeth at Main Street Grill. 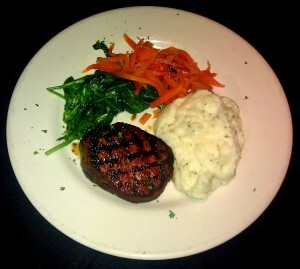 Mirabelle’s Grilled Beef Tenderloin is also one of our reasonably priced favorite steaks. It either comes with poblano cream sauce or Creole style with jalapeno horseradish. 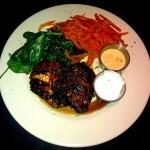 We ordered it Creole style because we were in the mood for some spicy and succulent chicken! 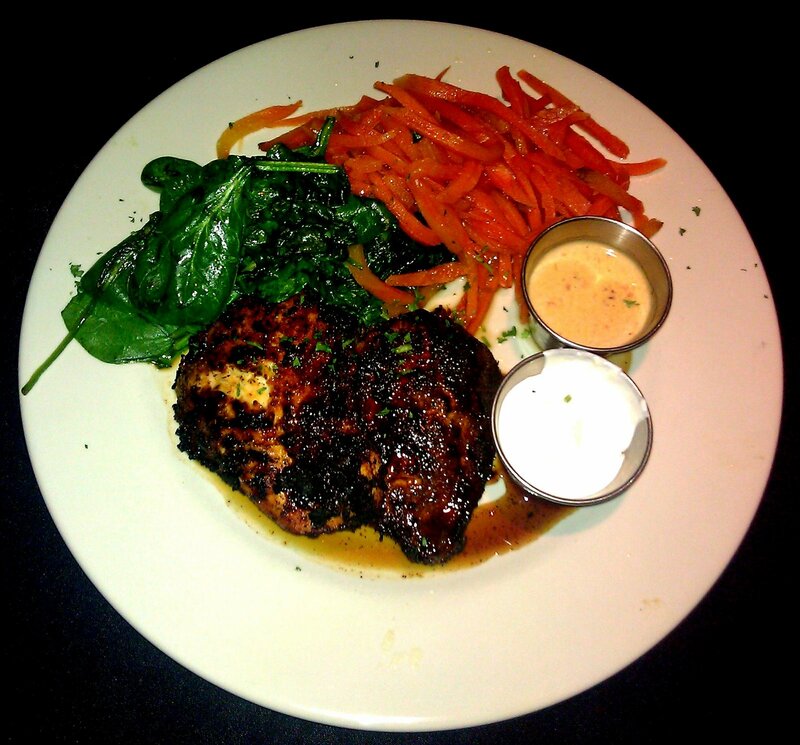 It also came with sautéed spinach, julienned carrots and choice of side item. Instead of getting a side, we requested more spinach and carrots and the waiter said that would be fine. The chicken was seasoned with a kick and juicy on the inside – we loved it! It was spicy and truly did taste like Cajun Tex-Mex. We actually had both dipping sauces on our plate, but neither added anything to this already powerful chicken. The generous amount of spinach and carrots were a nice side and complemented this dish well. We expected there to be some amazing-sounding desserts to choose from, but only a few stood-out on the menu. 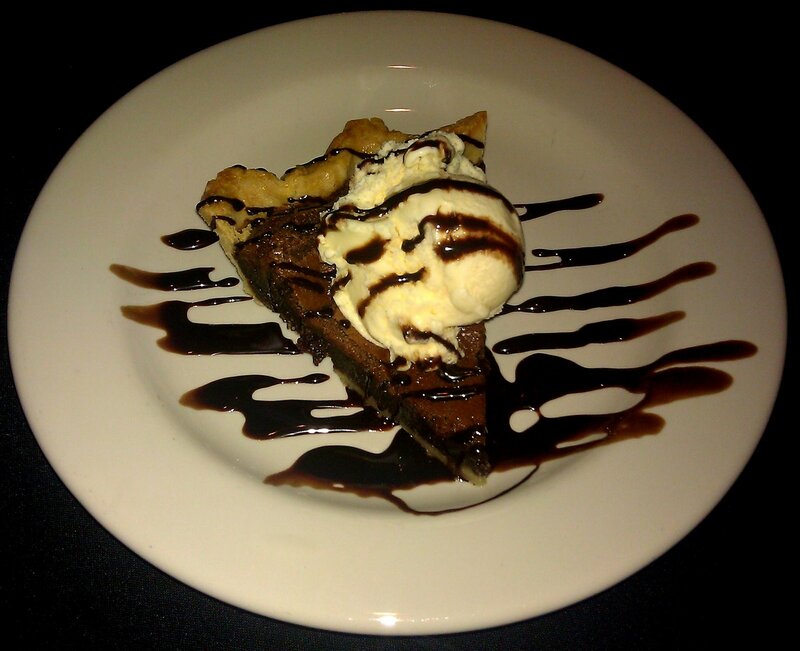 Our waiter recommended the brownie pie so we decided to get it. It was decent, but on the smaller side (the photo is deceptive!). Also, it wasn’t as decadent as we thought a fudge brownie would be. 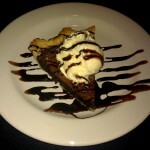 The ice cream was a great addition and went well with the brownie pie. Still, we may go with the raspberry tart next time and see if it’s more memorable. We dined at Austin Land and Cattle on a Friday evening. We thought it would be bustling inside and that there would be a wait, but this was not the case. Even though there were plenty of open tables, the hostess took us to one that was wedged in the corner of the back room. We asked for another table and were reseated in a much more cozy dining room. Our waiter immediately arrived at our table, introduced himself, and left us with complimentary bread. We had several questions regarding the menu and he very friendly and helpful. He did check up on us a couple times throughout the meal, however our waters were never refilled. At the end of our meal, there was a problem with the bill, but it was remedied without any hassle. Overall, the service was good but we expected a little more from this type of restaurant. Austin Land and Cattle is near downtown and is unassuming from the outside. Although we dined on a weekend evening, we were able to find parking easily. As you walk in, there is a wooden bar area, and a few tables in that first room. There are a few dining rooms, including a semi-private dining room decorated with John Wayne posters. The ambiance is modest and a bit eccentric, and patrons were dressed casually. The ceiling has some exposed ducts, and there were several cat paintings on the wall in our dining room. We didn’t think the ambiance matched the steep entrée prices. Also, we noticed that there was a large group of very loud, inebriated patrons in one room, so this place might be hit or miss on a date night. It is good for groups though. We still have a long list of steak restaurants to hit up and may not visit this one again for a while.